IMHO: Not to belabor the point, but on Tuesday night’s ESPN “Trojans Live” radio show, USC athletic director Lynn Swann gave a lot of compelling reasons why Clay Helton has his support. However, given the current wave of uncertainty among the massive skeptical Trojans’ fan base, the one thing that Swann didn’t directly do was directly come out and just flat out say that Helton would be back in 2019. Swann’s comments were more a strong inference that the coach would return than a clear, concise, and definitive statement. Most Trojans fans that listened to the radio show and responded on the WeAreSC message boards strongly made their opinions felt, and they seemed unclear what Helton’s status was with four games to go. Well, make that now three games to go with the visiting Trojans (5-4, overall, 4-3 Pac-12 South) escaping Oregon State (2-7 overall, 1-5 Pac-12 North) with a 38-21 victory on a chilly Saturday night in Corvallis. IMHO – Part 2: The Trojans’ win over Oregon State, coupled with ASU’s 38-20 upset over No. 15 Utah, puts the Men of Troy in a four-way tie for first in the South with Utah, Arizona, and ASU in the loss column (3). The Trojans need for Utah and ASU to lose another game, but it’s possible. The Trojans, who cannot afford another conference loss, own the tiebreaker against Arizona, as does Utah and ASU over Troy. ASU controls its own destiny in the South, but Utah lost its outstanding quarterback Tyler Huntley for the season with a broken collarbone. Utah hosts Oregon next week and then at Colorado and who knows with Utah now that they have lost Huntley. ASU will host UCLA next week and then plays at Oregon and at Arizona – no easy task. On paper, the Trojans have the schedule edge finishing against Cal and UCLA. IMHO – Part 3: So, in your eyes, did the offensive personnel changes make a difference last night in the Trojans’ victory over the Oregon State Beavers? Did you see a USC offensive difference in Reser Stadium or is Oregon State’s defense just plain lousy? Rhetorical question, I am sure. Have you now been reassured that the offensive changes were positive? Did Clay Helton calling the plays show a major commitment to running the ball effectively or was the OSU defense ripe for any ground game to gobble up chunks of yardage? Another rhetorical question. One thing for sure, the Trojans running attack did stay true to a point of emphasis, and nobody made that statement clearer than Helton’s run calls and his tailbacks Aca’Cedric Ware (17 carries/205 yds./12.1 avg./3 TDs/photo above) and Vavae Malepeai (15 carries/101 yds./6.7 avg.). Ware was a beast and Malepeai wasn’t that far behind. Of course, you still have to consider the opponent, but it was still an impressive performance, especially by Ware. IMHO – Part 4: Leaving out Lynn Swann’s vote of confidence for Helton and Swann’s imploring the skeptical and angry USC fan base to support the team despite some glaring issues on both sides of the ball, it says here regardless of the win over Oregon State, the jury is still out regarding the Trojans’ offensive staff rearrangement, considering the Beavers have the worst defense in the Pac-12 – both in defending the run and the pass. Let’s see how the Men of Troy do offensively against a tough Cal defense and the benchmark game, Notre Dame, before coming to the conclusion that the offensive changes were the answer. Helton now clearly owns the offense completely, and the final three games are his. Because of the offensive issues, it has somewhat obscured a USC defense that hasn’t exactly brought back memories of the 1969 Wild Bench as it pertains to controlling the entire game. That much was again evident against Oregon State. However, what can be taken away from Saturday’s game is that the Trojans snapped a disappointing two-game losing streak and are now one victory from becoming at least bowl eligible. Those two accomplishments kind of sum up where we are today in Clay Helton’s third season (a season without Sam Darnold) as USC’s head football coach – scratching and clawing to get to that evasive “magical” sixth victory. IMHO – Part 5: Although Oregon State reverted back to its losing ways after last week’s impressive overtime upset victory at Colorado, the Trojans badly needed either another bye to calm things down from this past week’s coaching turbulence or a victory on Saturday night, and beating Oregon State is sort of like the equivalent of a bye week. The triumph didn’t come easy until the Trojans’ talent melted the undermanned Beavers in the fourth quarter. Next Saturday, the Trojans will face an inspired Cal team (5-4 overall, 2-4 Pac-12 North) in the Coliseum, Troy’s homecoming game. Although Cal suffered a close and stressful 19-13 loss to No. 8 Washington State on Saturday night in Pullman, we’ll get a better idea of the reinvigorated Trojans’ offense with Helton calling plays and Drevno tweaking the offensive line against the Bears. Cal might not have the most imposing offense the Trojans have faced, but they do get after you with a tough defense, and last season in Berkeley, the Cardinal and Gold had to fight for a 30-20 win. And that was with Sam Darnold at quarterback. You can be sure that Cal will come to the Coliseum with plenty of piss-and-vinegar and plenty of confidence, so don’t underestimate the Bears knowledge that they are USC’s sacrificial homecoming lamb. 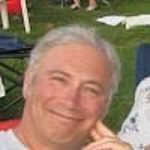 IMHO – offense: First, two injuries first come to mind. Wide receiver Michael Pittman left the game in the first quarter after suffering what is being called a shoulder injury. Michael was in street clothes after the first quarter, and running back Stephen Carr was carted off the field in the third quarter by what is being described as a lower body injury. Moving on, you had to be impressed with USC touchdown drives of 86, 68, 81, 67, and 62 yards. Give this tougher-than-the-score-indicated victory to Trojans’ senior tailback Aca’Cedric Ware who scored three critical touchdowns on Saturday night. Ware’s TD runs of 57, 2, and 62 yards broke the backs of the Beavers’ defense and probably caught the attention of NFL scouts. You also have to admit, it fired you up when you saw the Trojans near the goal line and JT Daniels took the ball under center with two running backs behind him to eventually put the ball in the end zone. Of the five SC touchdowns, four were scores rushing the pigskin. At the start of the game, the first thing to check was the Trojans’ starting offensive line. 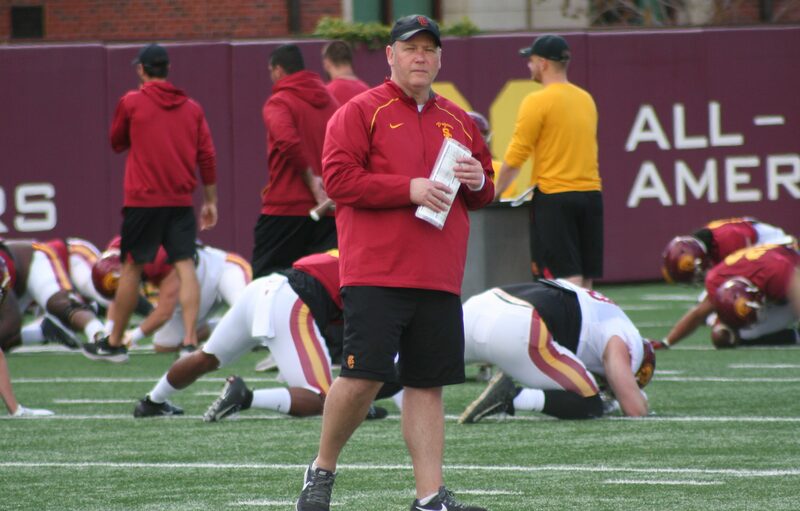 With Tim Drevno now in charge of the unit, the Trojans started the usual unit – Austin Jackson and Chuma Edoga at the tackles, Andrew Vorhees and Chris Brown at the guards, and Toa Lobendahn at center. This is the same unit that has started most of the season. It was guards Vorhees and Brown and center Lobendahn (who again struggled with shotgun snaps) that led the way for Stephen Carr’s 8-yard TD run to open the scoring. In all, Trojans back averaged 7.5 yards per carry. By the numbers, the Trojans rushed for an impressive 332 yards and passed for another 177 yards. Trojans’ quarterback JT Daniels was 14 of 26 for the 177 yards and one passing touchdown (41 yds. ), and Clay Helton had to be pleased with the offensive play calling – since he did all of it. Certainly, playing the worst defense in the Pac-12 would make most play-callers – professional or novice – look like the second coming of Vince Lombardi. IMHO – defense: Make no mistake about it, playing the Beavers’ offense is not exactly playing Alabama, but the Trojans defense stole the scrutiny spotlight away from the offense for most of the first three quarters with its spotty play. In the final quarter, the defense upped the intensity with quarterback pressure and ended the game with six sacks. Earlier, the Beavers exposed the Trojans defense late in the first half with two scoring drives of 45 and 85 yards, the latter an exposing two-minute drive. All this secondary leakage while holding the Beavers to minus-9 yards rushing in the first half. While most Trojan fans were worried about the USC offense in the first game after staff changes, it turned out it was the defense that gave cardinal and bold fans the shakes until the final stanza. Trojans’ defensive coordinator Clancy Pendergast walked into the scrutiny spotlight for a good part of Saturday night, and much of it was due to the lack of an early pass rush and poor USC secondary play, which showed a lot of holes until there was a legitimate pass rush. IMHO – special teams: Michael Brown converted on a 46-yard field goal in his only FG attempt on the night. Kickoff artist Alex Stadthaus has been outstanding previously, but Saturday he kicked off seven times but only accounted for two touchbacks. Perhaps it was by strategy, but punter Reid Budrovich averaged only 33.3 yards in three punts. Bottom line: The Trojans inched closer to being bowl eligible, which is an expected low- level minimum benchmark. It’s too early to judge the effects of the offensive coaching changes, but Clay Helton was more than happy about getting a big victory, snapping a two-game losing streak, and heading back to SoCal to concentrate on an improved Cal program directed by former Trojans’ defensive coordinator Justin Wilcox. Tackling the issues: ­­­­­­­­­­­­­DB Isaiah Langley and DL Christian Rector led the Trojans with nine tackles each. Next Saturday: The Trojans return to the Coliseum next Saturday night for a homecoming Pac-12 contest against the Cal Bears (7:30 p.m. PT/ESPN). Temperature: The Corvallis evening kickoff temperature was cloudy and 53 degrees. Turnstiles: Official attendance was 35,187. Reser Stadium lists a capacity of 45,674. The first: Trojans’ true freshman wide receiver Devon Williams record his first career TD reception in the first half, a 41-yard toss from JT Daniels. Williams led all Trojan receivers with 77 total yards with three receptions. 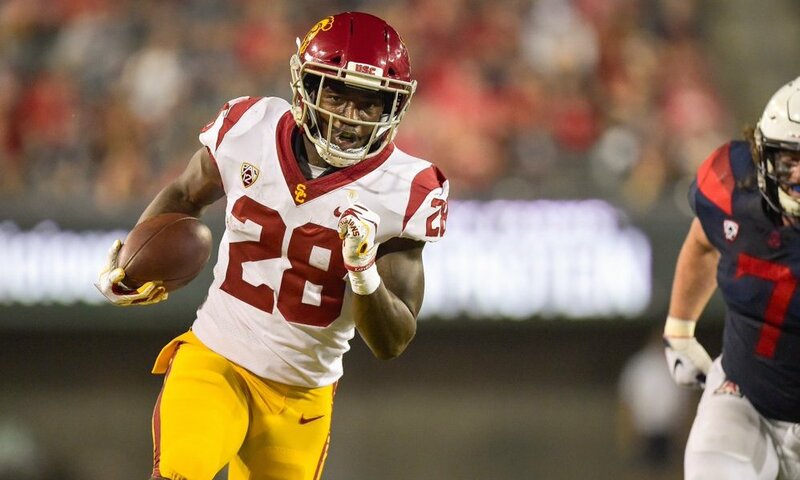 Hit of the night: After Trojans’ tailback Aca’Cedric Ware went 62 yards for an insurance fourth quarter touchdown, on the ensuing kickoff Trojans true freshman linebacker Eli’jah Winston jackknifed Beavers’ returner Champ Flemings. Ironically, Winston is from Portland, Oregon. The saw: When the Oregon State defense causes a turnover, the player that causes the turnover is given an actual buzz saw as a reward. Roommates: Both the Trojans and UCLA stayed in Eugene prior to their games with Oregon State and Oregon, respectively. The return: Inside linebacker Cameron Smith returned to action after being held out last week due to hamstring and knee issues. Smith finished the game with Oregon State with five tackles. On the rise: Against OSU, the Trojans scored 38 points. Prior to the Beavers game, the Trojans were averaging 27.13 points per game. On the decline: Against OSU, the Trojans allowed 21 points. Prior to the Beavers game, the Trojans’ defense was allowing 28.75 points per game. Big increase: Against OSU, the Trojans had 509 yards in total offense. Prior to the Beavers game, the Trojans were averaging 364.1 yards in total offense per game. A decline: Against OSU, the Trojans defense allowed 332 total yards in offense. Prior to the Beavers game, the Trojans’ defense was allowing 395.1 total yards per game. Huge increase: Against OSU, the Trojans had 332 net yards rushing. Prior to the Beavers game, the Trojans were averaging 120.9 rushing yards per game. Huge decrease: Against OSU, the Trojans allowed 31 net rushing yards. Prior to the Beavers game, the Trojans’ defense was allowing 174.3 net yards rushing per game. Significant decline: Against OSU, the Trojans had 177 yards passing yards. Prior to the Beavers game, the Trojans were averaging 243.25 passing yards per game. Significant increase: Against OSU game, the Trojans allowed 301 passing yards. Prior to the Beavers game, the Trojans’ defense was allowing 220.88 passing yards per game. The flag is way down: Against OSU, the Trojans had six penalties for 52 yards while the Beavers had four penalties for 28 yards. Prior to the OSU game, the Trojans were averaging 80.25 penalty yards per game while opponents were averaging 65.88 penalty yards per game. The last word: To lighten up the mood a bit, former Trojans’ All-Pac-12 and current Pittsburgh Steelers star receiver JuJu Smith-Schuster decided to have some fun on Halloween. JuJu dressed up in his full Steelers home uniform with helmet and went around the neighborhood with kids doing their trick or treat thing. Obviously, some of the neighbors were stunned to see the star receiver at their front door with the kids. All in all, it appeared that JuJu was well received by both the kids and adults. And don’t forget to set your clock back one hour. 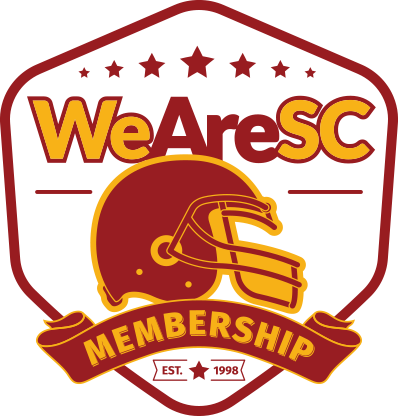 A longtime WeAreSC columnist, Greg began his affiliation with WeAreSC in 2001, introducing his well-received O/NSO (The Obvious/The Not So Obvious) column and later adding his respected IMHO Sunday opinion and tidbits column. 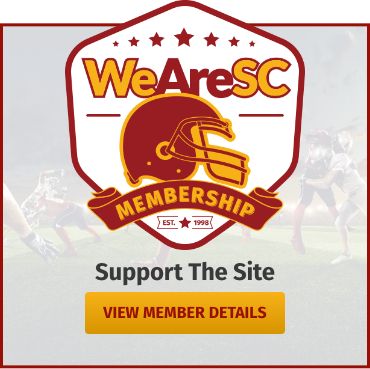 Greg, a former ESPN.com college football staff writer covering USC, is also is a member of the Football Writer's Association of America. He is also known in Southern California as a professional public address announcer, having called the the 1996 Rose Bowl Game between USC and Northwestern. Greg also holds a master's degree in athletic administration and is a former varsity high school coach of 27 years.